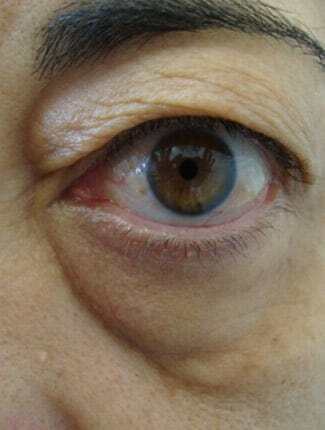 The patient presented with a very heavy upper eyelid, particularly in the inner corner of the crease. This pocket of excess skin also had excess fat which could be removed through a Blepharoplasty. The lower lids had significant bags and this caused a darker shadowing. 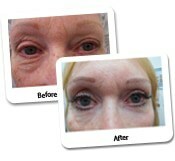 The patient underwent an upper and lower Blepharoplasty. 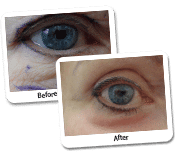 This procedure has opened her eyes, leaving her looking more awake and very refreshed. She now has a lovely natural upper crease and in this case, the darkness from the lower eye has significantly decreased. Patients who are considering eyelid surgery often contact the Dr Lanzer Clinic with some questions. To make things easier on patients, we have listed some of these commonly asked questions below. 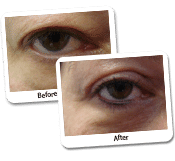 So, be sure to read the information below if you are thinking about having eyelid surgery at the Dr Lanzer Clinic. 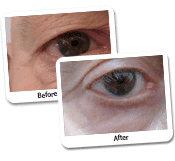 What Common Problems Can Eyelid Surgery Help with? 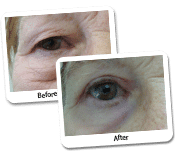 Heavy bags under the eyes and drooping of the upper eyelid can make you look tired, old and exhausted. 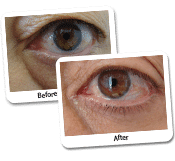 A Blepharoplasty procedure is performed as a day procedure and will literally open your eyes and make you appear awake and refreshed. 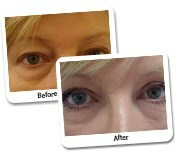 Which Patients Obtained Eyelid Surgery at the Dr Lanzer Clinic? Upper and Lower Blepharoplasty procedures are ideal for patients who have excess skin and fat pads on their eyes, causing heaviness and interfering with their eyelashes. Many of our patients have waited years to have the procedure performed and it’s amazing the difference it can make to their confidence. What Is the Ideal Eye Shape for Women? When looking at the ‘ideal’ eye shape in a woman, we generally picture a big open platform on the upper lid to apply makeup. It is, however, important to understand that even models don’t always have a large area here. Dr Lanzer uses his many years of experience to ascertain what will suit you best and what will look natural. He is realistic in planning what results you will obtain and ensures you have a good understanding. It is important to also recognize that what suits a woman is different to the approach taken with men. 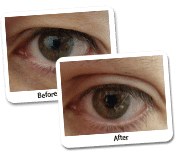 When looking at the eye area, we are taking in a range of considerations including the eyebrow shape. Dr Lanzer works with this shape, particularly in men, to ensure he achieves a masculine result. 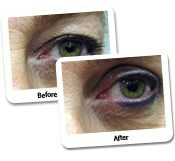 What Happens to the Skin Around the Eyes After Eyelid Surgery? Some patients are concerned with what happens to the skin after removing the fat. Will it end up loose and saggy? 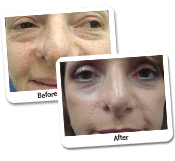 The answer is that the laser used actually causes contraction of the dermis and therefore tightening of the skin. In some cases, we will use an Erbium laser on the lower lid and/or just below the brow to increase this skin contraction and smoothing of fine lines and wrinkles. 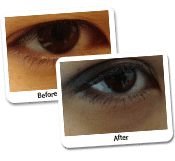 Where Can I Find More Information About Eyelid Surgery Before Making an Appointment at the Dr Lanzer Clinic? The Dr Lanzer Clinic has various information sources for patients who want to learn more about eyelid surgery. We have various case studies available, but also information pages where you can read more about the procedure. Of course, to learn what procedure is best for you, it is always recommended to book an appointment at the Dr Lanzer Clinic. Patients can take advantage of a free consultation, so be sure to make an appointment via email or telephone if you wish consult with Dr Lanzer.